Pfleger Hiring Lawyers to Fight Suspension? Fr. Michael Pfleger was suspended from his duties at St. Sabina's on Wednesday. Fr. Michael Pfleger, suspended as pastor of St. Sabina's Catholic Church earlier this week, may be setting himself up for a fight. 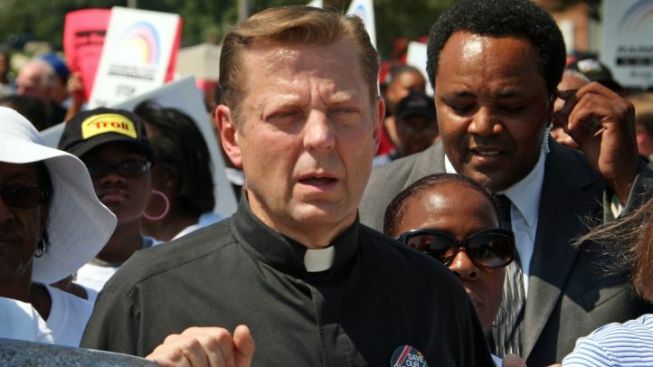 Sources close to Pfleger told NBC Chicago on Friday that the controversial south side pastor has hired two canon lawyers who believe he has a case. Pfleger was notified of the suspension Wednesday in a letter he received from Francis Cardinal George. Pfleger believes the cardinal acted on intentions, rather than his actions, sources said. While the cardinal has authority to transfer a pastor, the church laws on suspending a pastor and prohibiting him from performing the sacraments is quite stringent. During an appearance on the public radio program "Tavis and West" last month, Pfleger insinuated he would rather leave the Catholic Church than exit Sabina's for a principalship position at nearby Leo Catholic High School, as the cardinal wanted. Pfleger said he wasn't qualified because he was a priest, not an educator. The cardinal cited those comments as the primary reason for the suspension. Though Pfleger hasn't yet vacated Sabina's, the cardinal instructed Fr. Andrew Smith -- a former Englewood police officer -- to move in, removing him from St. Ailbe Parish. "Can you just imagine somebody moving into your house that really was not invited by us," said Kimberly Lymore, the Associate Minister at the Faith Community of St. Sabina. George has now left Chicago for Rome, where he'll attend the beatification of Pope John Paul II. Parishioners, saying they've repeatedly requested meetings with George, find the timing suspect. "For Cardinal George to really drop this bombshell and leave for that is unfair," said Lymore.